In my last post, I wrote about how digital utilization has infected our lives, both inter- and intra-personally. In this post, we will address digital etiquette and healthy digital use. More people are talking about being snubbed by their friends and loved ones. #Pphubbing is one example of the online discussion about how phone snubbing is affecting our relationships (see article by Huffpost.) 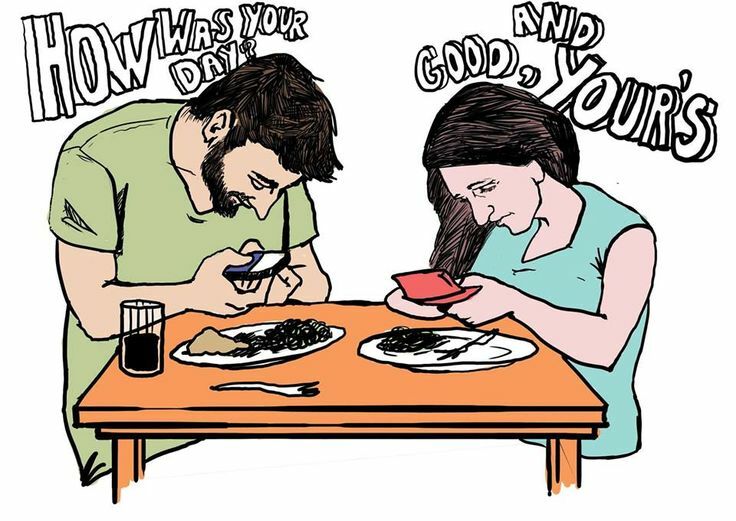 We have all seen it, if not participated in it: you are out with friends or family, and you see other people out with their friends or family, and everyone is walking, or eating, or sitting together and… staring down at their phones. In my previous post, I shared that a graduate student at the presentation disclosed that she has ended friendships due to phone snubbing. Hearing the frustration echoed in the room by other graduate students made an impression, given the bias that millennials need their phones more than air. It appears that our relationships with our phones are affecting our relationships with people. But given how interconnected our physical lives are to digital lives, what can we do so that we don’t have to end relationships with people or our phones? It’s actually pretty simple. It’s about going back to basics: 1) Think about your phone needs, 2) set limits, and 3) communicate. If you’re expecting an important call or message and you need to respond, let your company know ahead of time. This is reasonable behavior and people appreciate being given the respect of being informed. If you don’t need your phone, consider turning it off or leaving it in a safe place. Do you really need your phone to be buzzing, face down on the table while having coffee with your mom? The vibration itself is a distraction from being present. Odds are that you will reach for your phone eventually if it’s there buzzing. Try going without it and see how you feel. Agree to go phone-free. Whether with your partner, friend, or family, time is precious and hard to come by with busy schedules. Mutually agreeing on being with each other regularly without distractions communicates that you value each other’s time and company. One hour without distractions will leave you feeling more fulfilled than spending four hours with your attention split. And your phone will always be there later. Reflect on what is causing you to check. Are you checking your phone because you’re anxiously waiting a reply? Are you using your phone solely to communicate? Are you using an application because you need to? Or are you feeling bored, lonely, or uncomfortable with your environment? What would it be like to just let yourself feel those things? There are times when we need our phones and times when it’s more of a scapegoat. There exists a peril to using your phone to avoid certain emotions – we come to depend on it. Teach yourself to be okay with discomfort by just being and looking ahead, not avoiding, and looking down at a screen. Healthy digital usage is possible. There are many tips out there for how to unplug (see #ourrelationshipwithsmartphones) which can be helpful from time to time. Digital detox camps and support groups are available for those who need extra support. However, like 10 day Vipassana retreats, digital detox camps are meant to kick start changes we can implement in our daily lives. Finding a way to use your phone without letting it run your life (i.e. impacting sleep cycle, snubbing loved ones) is a necessary step as the world becomes more connected. Let’s start by being intentional about our level of connection, conscious of our usage, and respectful to our loved ones.